Microsoft Access save tables, macros, forms, queries, etc. in a file with .mdb/.accdb extension. 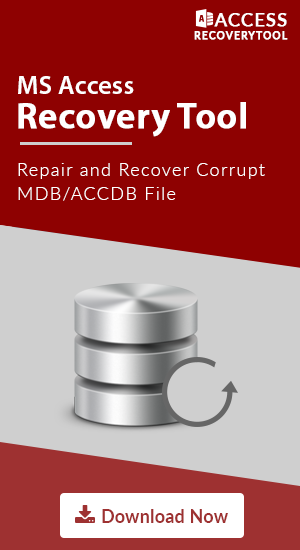 The MDB/ACCDB files are very sensitive to damage due to various reasons like power shortage, sudden closing of MS Access, virus infection, etc. Several times user has to face access database error, some of these error can be fixed instantly but some of them can cause a serious issue. One of such error is Microsoft Access database error 3049. This error occurs while opening Access file or also, may occur at the time of adding new records to database. It is suggested to compact Access database more frequently to keep Access database healthy. Sometimes, due to some unwanted reason Compact database is interrupted and now user may unable to access their Database files. What Causes MS Access Error Number 3049? The Error itself reflects database is inaccessible or stopped due to some unknown reason. After reading error you will come to know that this runtime error 3049 occur due to two main causes. MS Access database (.mdb/accdb) file you are trying to access is a corrupt file. There are various MS Access database corruption causes. Trying to open another database such as SQL Server Database, Dbase, etc. which is not linked with Jet database engine. Some times this error occurs when file size limit is exceeded while adding any data. As File Size limit of Microsoft Access is up-to 2GB. Before trying any solution, the user must check the file accessing is a correct database file. After checking, user must take a copy of corrupt access database MDB/ACCDB file, before applying any changes. Compact & Repair Utility: This MS Access database inbuilt utility use to repair MS Access error 3049 and other corruption errors. Not only this it also helps to reduce the size of MDB/ACCDB database files. If the error message appears again then there is need to apply another approach to fix Microsoft Access Error 3049. Access Repair Tool is a quick solution to fix Access Error 3049 without hampering the original database file. Windows Inbuilt C: drive Utility to repair MS Access runtime error 3049 might be little bit confusing. Does there any this kind of utility exist that can repair Access error 3049 i.e access database error cannot open database? Then answer is ‘Yes’ it exist that repair any type of MS Access database corruption including Error number 3049 and it will not compact and repair MS Access file. I found this useful when above method failed. Step4: Add Datasource name(any name) >> Under Database click on Select and choose the .mdb file to repair. Click OK. The user can manually fix MS Access database error number 3049, but if corruption is severe then above solution fails. Also, it’s very time consuming. So in such case, Access Recovery Tool is the perfect solution to resolve MS Access Error 3049 i.e a corruption error. With its advance programmed algorithm user can perfectly recover and restore access database with all queries, table’s structure, primary key’s, table’s data and objects without hampering the original data. The user might always have a fear in mind of losing MS Access file data from the database. The file can be corrupted or lost somehow. A well know MS Access error 3049 is discussed here in detail. Also, we have gone through a less known approach to repair any MS Access Error that causes corruption. With this, we concluded with the best-guaranteed solution to repair corrupt Access database.